This is a pumpkin pie for the big girls and boys. The spicy cookie crust and the bourbon sauce make a nice alternative to the traditional pumpkin pie. Place the gingersnaps or Speculaas in a food processor and wizz to a fine crumb consistency. Add to the crumbs and wizz in the food processor. Grease a pie place and press the crumbs evenly into the plate to form an even crust. Bake in a preheated oven for 8-15 minutes. Place all the filling ingredients in a blender and puree until smooth. Pour the filling into the pastry and bake at 300 (F) for 45-60 minutes. Mix the sugar and water in a small saucepan. Heat to make a syrup. Stir well, while the mixture is heating. When the mixture has become a syrup remove from the heat and allow to cool. Once cooled, add the bourbon or vanilla. 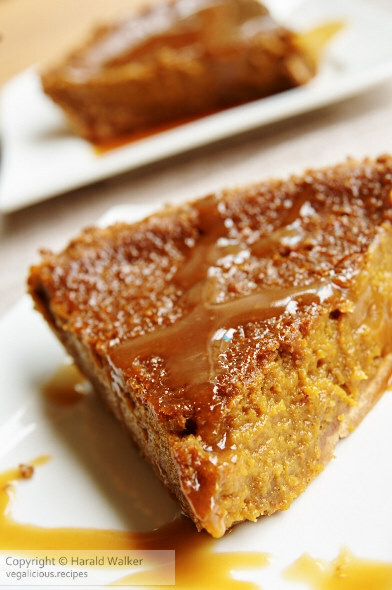 Serve the pumpkin pie sliced with the bourbon sauce drizzled on top. For those in Europe, Speculaas cookies are a good substitute for the gingersnaps. Posted by Chris Walker on November 6, 2009 in Desserts and Sweets, Pumpkin.